Volunteers - Le Jardin Community Center, Inc. Volunteers are an integral part of the success of our organization. Volunteering provides an opportunity to brighten the lives of children in the classroom and connect with your local community. Volunteering with us also can provide great skills to place on your resume and may even provide preference of hire for open positions. We always welcome volunteers to read to the children, assist the teaching staff, enter data in our computer software, clean, serve food, and more. There's a place for everyone to help at Le Jardin! Please visit one of our center locations to learn how you can volunteer. The Ager family created a vegetable and herb garden on 2/7/15 with both plants and a variety of seeds. Delany Ager worked on the project to increase science skills and is now in the run for the Girl Scout's Gold Award. Also on hand was Maria Motta from Le Jardin and friend of the family friend Alessandra to help. This is Delany's 3rd project at Le Jardin. She has also created a library at site 2 and collected school supplies for site 1. Several volunteers got involved in the classroom the week of March 3, 2014 to read Dr. Seuss books to the children. Father-Involvement is very important for a young child and Le Jardin loves to see fathers getting involved and helping their children learn. We are proud to say that several fathers participated in this event. 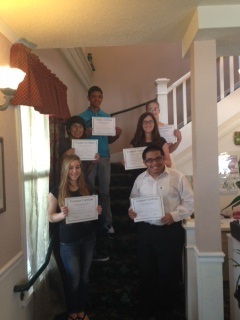 Le Jardin held a Volunteer Luncheon at the Whistle Shop in Homestead to honor high school and college volunteers. The volunteers spent time in classrooms working with preschoolers, creating libraries, clerical duties, assisting managers in nutrition and heath, assisting the preparation for the upcoming school year and creating tools and material for children with disabilities. Picture from left to right, front to back: Reena Rose Smith (South Dade High School), Jose Diaz-Rivera (South Dade High School 2013 graduate), Andrez Martinez (Miami Dade College Student), Delaney Ager (South Miami Middle Community School and Girl Scout Troop 252), Jesus Jimenez (Keys Gate Charter High School), and Megan Terrell, (Keys Gate Charter High School).